i'm super excited about today's post... when i got the opportunity to review a Skindinavia product, i definitely jumped at the chance! i've always been interested in their products, but hadn't ever tried any. their newest products are really revolutionary (in my opinion!)... makeup primers in SPRAY form. what an amazing idea! 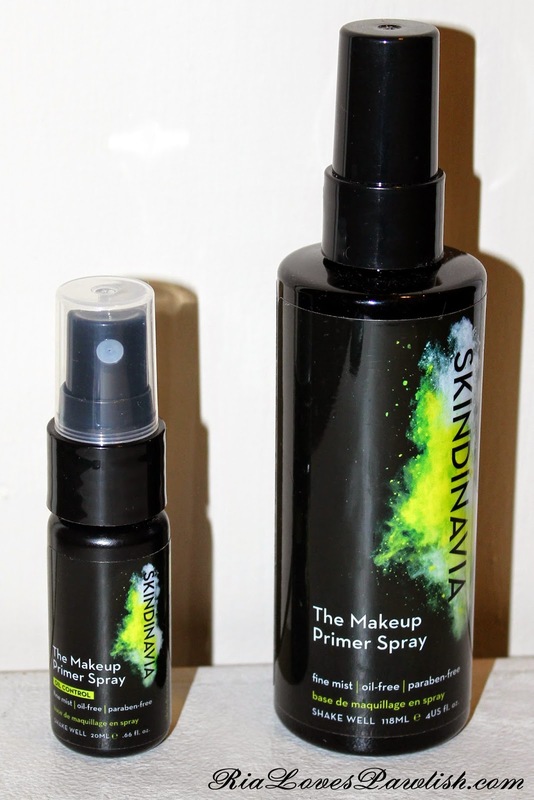 i was lucky enough to be sent both Skindinavia The Makeup Primer Spray and Skindinavia The Makeup Primer Spray | Oil Control to test out. i figured that the oil control version would be the best fit for me, but i was glad to be able to compare the two. here's a look at the packaging... Skindinavia recently revamped their whole look and i love it! The Makeup Primer Spray and The Makeup Primer Spray | Oil Control both retail for $35 for 4oz and $49 for 8oz. The Makeup Primer Spray is applied after moisturizer but before starting your makeup routine. i spray my face in while making a T, then an X as the bottle advises, then i put my face in front of a fan to help it dry more quickly. my little desk fan isn't unpacked yet, so i'm currently using a giant floor fan! works just the same :) both these sprays really help prolong the wear of your makeup... The Makeup Primer Spray helps my makeup to not break up and stay on longer... while The Makeup Primer Spray | Oil Control does that AND really helps keep my face matte. i would say this is the best product at controlling oil i've tried to date... and that's saying something as i've tried loads! i did try using The Makeup Primer Spray | Oil Control over a traditional silicone based primer meant to blur pores... i found that it actually did not work as well over the silicone primer. i find that that my pores aren't quite as noticeable when using The Makeup Primer Sprays, and i much prefer The Makeup Primer Sprays over any traditional silicone primers... i actually returned the silicone primer i bought earlier this month today! to replace it, i ordered The Makeup Primer Spray | Oil Control from the Skindinavia website yesterday! i also ordered The Makeup Finishing Spray | Oil Control... i will be sure to review that once i've tested it out :) if you are interested in both priming and setting sprays, there are special kits that save you money (i bought The Makeup Artist Kit | Oil Control in 8oz for $60... saving $28!). also, the www.Skindinavia.com website is having a free shipping/free sample offer on orders over $40! sadly, tomorrow (Friday 23, 2014) is the last day... i apologize for not having the review up sooner! please let me know if you take advantage of the offer and what you think of the products!